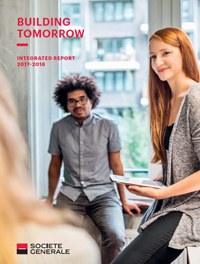 “Building tomorrow” is the title of Societe Generale group’s very first Integrated Report. Inspired by the guidelines of the reference framework published by the International Integrated Reporting Council (IIRC), this report presents Societe Generale’s long-term vision and strategy, its business model and model of value creation. It describes the Group’s activities and results for the financial year 2017 with a view to enhancing dialogue around our commitments with all our stakeholders, in a proactive process of transparency and progress. Our very first Integrated Report presents Societe Generale group's achievements in 2017, its ambition and strategy in a world undergoing profound change. Our intention is to provide explicit information on the Group’s performance in terms of its value creation model, working for the benefit of all its stakeholders. Societe Generale is about more than performance and results: at its heart is the commitment of its 147,000 members of staff, the men and women who work each day to build the world of tomorrow. For 18 years, Calligraphy-Print, a printing firm located near Rennes in northern France, has been countering the structural decline in volumes and margins in the printing sector by striving for industrial excellence backed up by major investments. The company is now one of the most successful in the region, and is attracting big names from the SBF 120 stock market index, partly due to its strong environmental certifications. Big name supporters include Societe Generale, with the contract to print the bank’s very first Integrated Report.